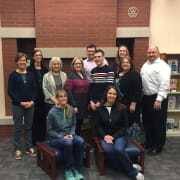 The Waukee Public Library Friends Foundation supports and enhances the programs and services of the Waukee Public Library through volunteerism and by providing for the ongoing and long-term financial needs of the library. The Friends Foundation conducts semi-annual book sales and maintains a Book Nook in the library. It coordinates all donations and major gifts to the library. Members promote understanding and use of the library's resources and services in the community by participating at library and local events. The Friends Foundation Advisory Board works to expand membership, increase awareness of library resources and needs, and explore funding opportunities to keep pace with our growing community. Would you recommend Waukee Public Library Friends Foundation?